Indian food is segregated into different categories over regional delicacies, which makes it a wide-ranging cuisine. Among these regional cuisines, people would not find many restaurants that serve authentic north Indian food in Dubai. Therefore, north Indian cuisine lovers face lot of difficulty in finding a bistro that can sate and satisfy their craving with this fare. Chhappan Bhog in Al Karama community of Dubai is a perfect venue for such north Indian foodies, as this restaurant serves delicious varieties of the area. This includes dahi bare, snacks, sweets and much more, which guests can enjoy at extremely affordable rates plus spices in the food are also not overwhelming, so even the first timers would not face any problem while consuming this venue’s food. Due to these features, Chhappan Bhog is a favourite with the local Indians and some tourists as well. 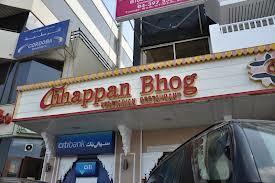 Chhapan Bhog is a small eatery that has expertise in preparing north Indian cuisine, which tastes like homemade food. North Indian delicacies like seasonal vegetables, puris, dahi bare and paani puri are some of the highlights in the menu of this bistro. Waiters in the uniform are well trained and they ensure that guests would not face any inconvenience in obtaining the meal. Take away service is another fine feature of this eatery through which locals and tourists take pleasure in its mouth-watering dishes. This venue serves breakfast, lunch and dinner therefore its operational timings are from 9:00 am to 11:30 pm. Moreover, you can visit this bistro on any day of the week, as it opens daily. Off Trade Centre Road, Karama - Dubai - United Arab Emirates. 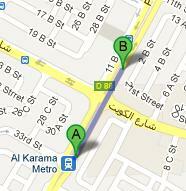 Head northeast on Sheikh Khalifa Bin Zayed Street/D 88 towards Kuwait Road after exiting from this metro station. Centre Point Shopping Centre 1 – Dubai bus stop is 130 meters away from Chhappan Bhog, which makes it just 2 minutes walk. All bus passenger need to do is to head out in the southwest direction on Sheikh Khalifa Bin Zayed Street/D 88 and soon they will find the destination. To reach this bus stop people can use any of these bus numbers 21, 29, 33, 42, 44, 61, C5 and C10. Check map for directions.